When I came into work this morning there were still little Eastern Phoebes in the nest. An hour later, I clicked on the site again and they were all gone. Now the question is, will the phoebe lay a second clutch of eggs? My previous question has been answered. According to the Cornell site, the bird's hatch date was May 22. 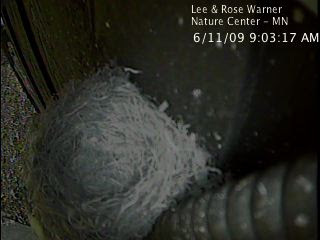 That was 20 days ago which means having the Cowbird in the nest did indeed slow down the development of the phoebes. They usually fledge in 15 to 16 days.